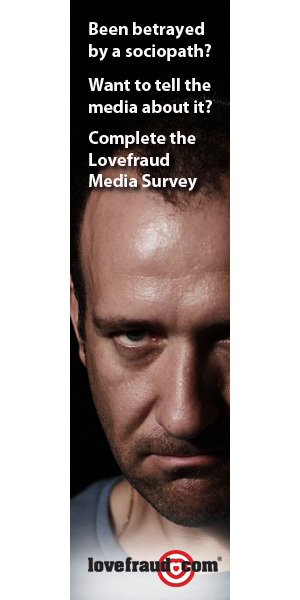 If you’re reading Lovefraud, it’s probably because you suspect that someone in your life is a sociopath. This person’s behavior has baffled you how can he lie so prolifically? How can she be so cold? How can anyone behave so horribly and then act as if nothing happened? So you went looking on the Internet for answers. You’ve plugged this person’s upsetting behavior into your favorite search engine and come across a list of traits such as Lovefraud’s Key Symptoms of a Sociopath. Check, check, check the person exhibits all or most of them. The correct answer is to get the person out of your life as quickly as possible. But some people don’t do that. Some people stay involved with the disordered individual. Here are reasons why and why they’re bad ideas. 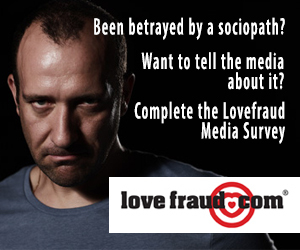 On Lovefraud, sociopathy is a general term for the Cluster B personality disorders antisocial, narcissistic, borderline. 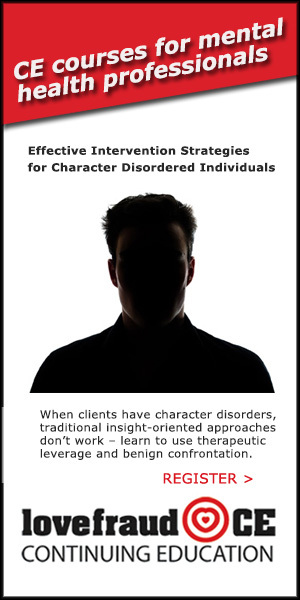 These disorders define the way the person interacts with the world; they are ingrained into his or her identity. Maybe treatment will be available in the future, but for now, once a sociopath is an adult, there is no rehabilitation. 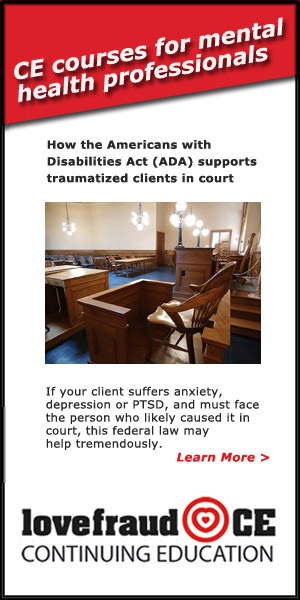 No drug or no therapy program has been proven to make any difference. In fact, there is research indicating that therapy makes sociopaths worse. It doesn’t matter how much you love, the sociopath is incapable of feeling love, and incapable of truly receiving your love. That is the core of the disorder an inability to love. But what about all the declarations of love this person spoke to you? It was playacting. Sociopaths say “I love you” because they know that if they speak those words, they get what they want. The sweet nothings really are nothing. You very well may be smarter than the sociopath, but it’s unlikely that you can beat a sociopath at his or her own game. The sociopath has no conscience and no remorse. This means the sociopath has no qualms about engaging in vicious, underhanded lies and attacks. The sociopath’s objective is to win, and he or she will play dirty very, very dirty in order to achieve that objective. If the father or mother is a sociopath no, they don’t need this person. Remember, sociopaths are incapable of feeling love and that includes love for their own children. Sociopaths are terrible parents. At the very least, they are disinterested. At worst, they are highly abusive, or they actively teach the kids to engage antisocial behavior. If you can manage it, the best thing to do is get the sociopathic parent out of your life, and your kids’ lives as well. Sometimes, unfortunately, the sociopath won’t let this happen. In this case, do your best to keep contact to a minimum. The sociopath has drained your finances and put you into debt. He or she may have convinced you to invest everything you have into some sure-to-succeed business deal except the deal failed. He or she is promising to pay everything back. It’s very possible that the sociopath has no intention of keeping that promise. If the sociopath has no job, no money, no credit and no assets well, any money you gave him or her could be gone. You may have to just write off your losses and move on. No, there isn’t. All your life, you’ve heard cultural messages like “we’re all created equal” and “deep down, we’re all the same” well, these bromides do not apply to everyone. Sociopaths are empty suits, cardboard cutouts, automatons use whatever term helps you understand that there really is nothing inside. 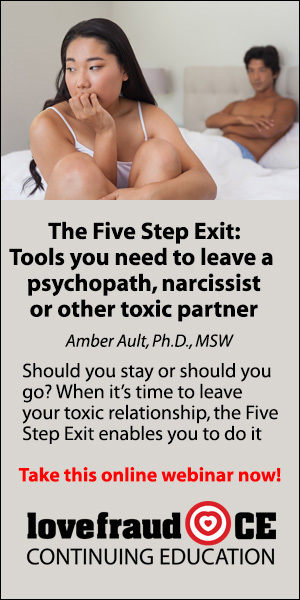 So, if you’ve realized that there’s a sociopath in your life, but you’re considering staying involved with this person for some of the above reasons, know that the longer you stay, the harder it’s going to be to get out. Please change your mind and leave as quickly as possible. “I MUST be wrong. EVERYONE likes him. And he enjoys all of them too. And, it’s not all bad. At least he’s not cheating on me. He can’t stand to touch woman parts so I know the phone hangups are not from women. And because he’s so fun, it makes sense so many married men have mancrushes on him. Dear people. The reason it’s so confusing is that you are well and truly being screwed and you don’t know how bad it is yet. There’s a lot of sneaky hidden stuff being done to you that you find out later. It gets worse, a lot worse. My husband pressured me constantly to commit suicide. Murder by suicide. I because VERY ill. I know of people who were murdered by cancer, or murdered by stress (same cause, sociopath). When you are INSIDE the nightmare, it’s near impossible to imagine a life beyond it. If you can just remind yourself that there was life before him, and you just have to get through the nightmare, you will rediscover all the wonderful possibilities of joy and happiness… wonderful life that would never have been if you were still with “HELL on EARTH”, a monster, a sociopath. Important message. Thank you. However, many of us former victims learned from childhood onto adulthood that we were “never good enough”. As a result we reinforced our own misery and dysfunction by assuming the role of “undeserving” and “inferior” object. Human tenderness came only from a person who sensed our neediness and twisted our core until we became zombies. No center, no identity, no reality! I know I became what some call “an inverted narcissist”. I believed I was a total non entity and proceeded to annihilate myself both consciously and unconsciously whenever the opportunity arose. Coming from dysfunction we often seek out similar scenarios that fit our internal sense of what we deserve. After many years, and many failures, I learned to reprogram myself. I work on my own ethical landscape and find resources that have educated me and nourished my soul. I could not face myself while I was married. After 30 years, I relocated and began my journey toward recovery. For me, improving my own character was the road to recovery. Becoming the best person I could be is an ongoing journey. The road gets easier and easier to navigate since my exit from my sociopathic mate. 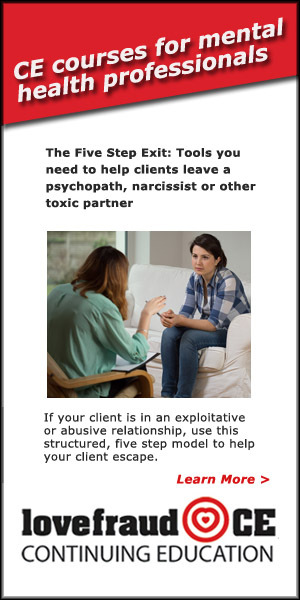 The real work comes once we exit the arena of narcissistic abuse. It’s never over, even when it’s over. Moving out, but not so far away, allowed me to nullify the toxic associations embedded in my psyche for so many years. Kalina – I hope you check back as this reply is for you. Thank you for your post – it made my day today. Your story is my story. Your words of hope are precious to me. No judgment, no unrealistic assignments or advice, just a *thoughtful path forward that worked for you*. One of the recent articles had a wonderful statement also – “know that you will leave someday.” So helpful, so validating, so kind, so empowering. Just what I need right now. I continue to take baby steps forward and I know I will be free if I keep moving in the right direction. So many twists and turns in my own process as I navigate through my particular version of a long-term sociopath. Best wishes to you – thank you for listening to me and for the much needed reassurance. NotWhatHeSaidofMe – Thank you for your very astute additions to the list. 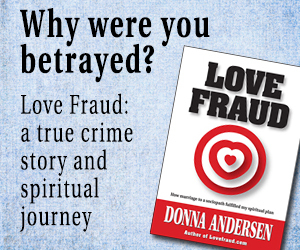 I am so sorry for what you endured, but am so glad that you are now able to share your experiences on Lovefraud so that others may learn and heal. The difficulty is leaving only to find more. Which has happened to me, again and again. I think 50% of people or more are sociopaths. I don’t know if I am overthinking it but I think they DO feel. They must or wouldn’t do some of the things they choose to do. But keep stepping over the edge into emptiness and then abuse just to feel again. So, if the stats are as they suspect… is it not better to adapt to the environment given they are everywhere? Do we want to become closed shells just because someone is screwing with us? From my observations, everything a sociopath says is really directed at him or herself. 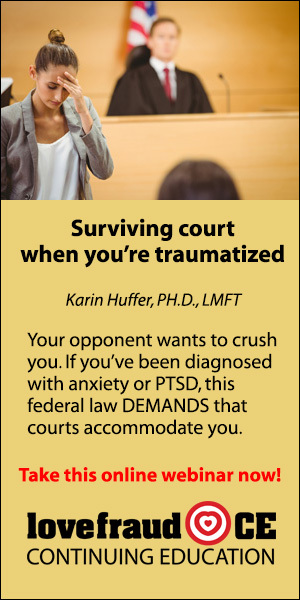 If they are unable to feel you, they speak out aloud judgments of themselves towards you. So if he is telling you to murder yourself, it’s because your good presence triggers his awareness that he doesn’t belong in humanity, and that he should murder himself. I think they work this way. I just realised it this morning when an ex I had been trying to be friends with lept into a tirade of criticisms about me being lonely, just because I had raised an emotional issue. When I read back over it, I realised those comments didn’t relate to my life at all. Those were about his life and how he saw himself. Knowing this made it incredibly easy to let go of the mental gymnastics. Their low self-esteem runs their lives. They know they shouldn’t be here and they are constantly aware of that fact. But, saying life can be psychopath-free? I’m not sure. Most empaths I would tell either deny or don’t care. Most workplaces and social circles have sociopaths, as I’m now able to spot it. So – avoid or adapt? Star, you have put your finger on the dilemma; sociopaths exists EVERYWHERE (including the judicial system). So, how do we avoid them without either becoming completely solitary or trying to educate others, thereby risking being called “crazy”? Our society, as a whole, seems to be growing ever more mercenary and un-compassionate; how do we combat this trend? Form groups leading to a movement? Who knows? Yes! When my ex said something about me, he was usually speaking about himself… my therapist had a term for this… it wasnt projection it was, and Im guessing bc this was years ago, part of dissociation, where his mind actually believed it was being your experience or emotion etc. She explained this is why he told his mom to make ME stop, crying on the phone to her, after he had dragged me by my hair and thrown me into a wall. I was so confused why he was doing and saying that like I had done something to him. As to being more than 50% sociopaths out there? Its a good guess… back when I was studying to become a social worker, and I was noticing the increase in certain trends, I thought OMG, this is just creating a generation of narcisists… only time will tell. Well, guess what, it is now 20 some odd years later and I too see them… our modern day adults are very different then the adults I remember seeing growing up. This includes, non sociopaths as well… we are a very me oriented society now. 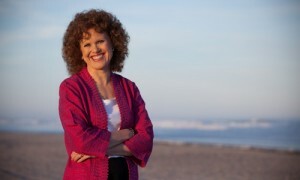 Thanks for another great article Donna. Thank you for Love Fraud. I agree about the generation and certain trends that you mentioned above. After my ordeal, I cut contact with a big social network or group of people,friends,aquaintences. I see people and things much different now. The book “The Wisdom of Psychopaths” does a great job of explaining this “brain type” in a way that makes it more understandable as to “why” they are the way they are. Their brains are different. “The Psychopath Inside,” by James Fallon does the same thing. For me the problem was that I was raised by two psychopaths, so I just assumed that the man that I was in love with was normal. 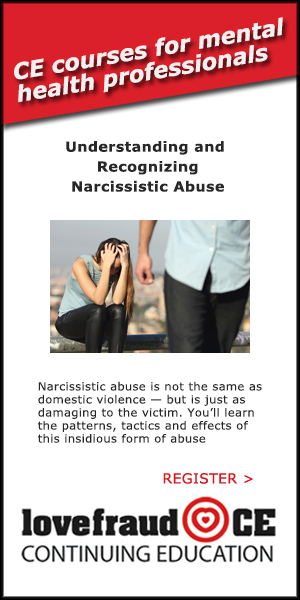 He wasn’t, of course, but being with him over the last 3 1/2 years gave me a PhD in “psychopathy”… and narcissism, etc. I got free… not unwounded, but unbowed. And because I’m a working, successful and highly effective therapist, going through this “drama” myself gave me gave so much information, so that I now can more effectively help my clients out of their NIGHTMARE! Thank you, Donna. I send all my “unexamined victims” to your website. Bless you for doing this work! James Fallon IS a psychopath so be very careful about reading his book as all psychopaths use brain washing, mind control, hypnosis, and trance even in their emails and in JF case in his book most likely as he is a very manipulative psychopath. Personality I had enough mental abuse from a psychopathic husband (now ex) so I would not buy a book for that very reason nor would I want to give money to a psychopath especially one that down plays his personality disorder like James Fallon does. Another good article that is generating some interesting comments. I certainly agree that we are experiencing a cultural shift. I recently came across a reference to the book ‘The Narcicissm Epidemic”. Haven’t had time to check it out but with a title like that I am expecting some good insights. I read an article a year or 2 back that really helped me in several ways and made a lot of sense. 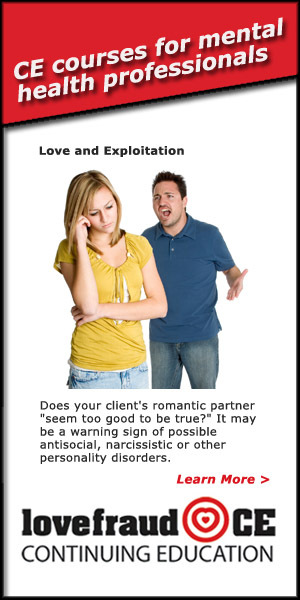 Empathic people are natural targets for sociopaths, protect yourself. Not sure if that is exact but close if not. The key difference in this article was that along with Empathic people, and Sociopathic people, there was an added term or category- Apaths. When I view the info through this expanded lens it helps me to see just how easily these individuals with lower levels of empathy can be used as pawns and weapons by the one or ones who are conscience-free. Since those driven to dominate others are now glorified and followed the less empathic – Apaths can and will likely continue to be groomed by their moe sociopathic leaders. Whether these more apatheticly inclined individuals actually believe the lies or are just more likely to turn their heads and pretend they saw nothing tends to go well for the Sociopath. They may see clearly but fear consequences. They may have grown up in disfunctional families and think this is normal. I would love to hear some feedback on this subject. Since your daughter will soon be 18 and reached the age of majority, she will be free to make her own choices; the court no longer has jurisdiction. If father then choses to give her room and board, that’ll be entirely up to them. You’ll just have to understand that legally she’s now considered grown and is solely responsible for whatever she does. 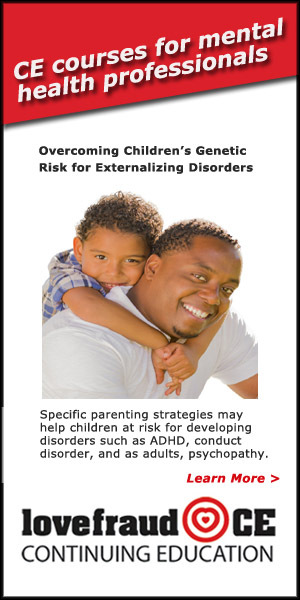 My 5 beloved children became psychotic in their adult lives; so powerful are the genetics of this illness. You must be prepared for this possible eventuality and my advice is to stay out of it. There is no obligation to take her on a cruise. If she will make you miserable, then don’t take her – enjoy yourself. She doesn’t live with you anymore so you are allowed to live your life without scheduling it around her and her spying missions. Maybe experiencing the consequences of her spying and lying will help, but if she is also sociopathic then there is no remedy. Our former pastor **** **** is a sociopath. It is hard to understand how his wife stays with him. It was uncovered that he was in an 10 year affair, but his wife **** **** does not seem to care. Either he is a really good and smooth liar, or she knew this was happening. It didn’t affect her too much. Could she also be a sociopath, removed emotionally? For a personal that does not suffer from this condition, it’s hard to relate to her and how she can still be with her… could she be under the spell? Please let me know your thoughts to understand better. Our congregation is hurting.